Stunning Sikh Wedding at Hyatt Regency, Ludhiana with Inspirations from the West! This gorgeous sikh wedding held at Hyatt Regency, Ludhiana is full of new wedding ideas and fresh inspiration. Pavnique and Vippy decided to have a traditional sikh wedding ceremony, while also adding a dash of western wedding style to it. They picked a stunning theme of green and gold with hints of pink to accent the combination beautifully. 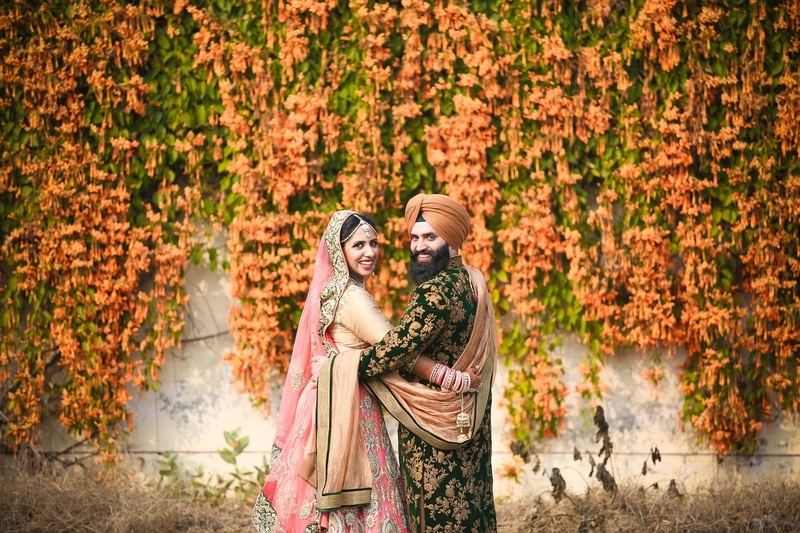 Every element of this traditional sikh wedding held at Hyatt Regency, Ludiana was beautifully shot by ace wedding photographer Ananya Rijhwani – she, along with her team excellently captured the details of this beautiful wedding. From the lily adorned cake, to the embellished bridal bouquet and even the warm hugs captured in beautiful candids – this wedding is full of beautiful things. Our No. 1 most favourite thing about this Sikh wedding was the incorporation of bridesmaids and groomsmen in Pavnique and Vippy’s bridal party. The groomsmen had their attire matched right to the T! Dressed in their gold textured jackets with pants to match and wood brown shoes to complete the entire look. Their contrasting pink safas were a dapper addition to their entire Swagger Groomsmen look. The girls however, took on a darker shade. Flared anarkalis in a gorgeous hue of emerald green with gold accents to match. What was especially cute was how they even matched their hairstyles – loose curls for the win! The nuptials held at the gurdwara were holy and serene – our beautiful bride, Pavnique dressed in a gold and pink bridal lehenga with glittery all-diamond jewellery looked like a quintessential Punjabi bride. Her single draped dupatta and 3/4th sleeve blouse was a fitting choice for her heavily embroidered bridal lehenga. Since Pavnique opted to match the dapper groomsmen in gold, Vippy matched the bridesmaids in his dark toned green and gold zardosi sherwani. Once Pavnique and Vippy sealed the deal – it was time to party! A beautiful outdoor space was set up with pretty drapes stretched out in shades of gold and blue, while table settings completed the wedding colour scheme with its pink and white floral table tops and gold chivari chairs. The high-top floral arrangement on each table made this beautiful sikh wedding look even better. Pavnique and Vippy’s stunning sikh wedding with impressions of wedding inspiration from the west has us inspired and how! The outfits, jewellery, the cake and not to forget the beautiful bridesmaids and groomsmen. Their wedding proves yet again how you can never go wrong with matching EVERYTHING to your colour scheme – yes, even the people in your entourage!